Solver for the inverse position kinematics that uses Levenberg-Marquardt. by using a Levenberg-Marquardt method that automatically adapts the damping when computing the inverse damped least squares inverse velocity kinematics. by using an internal implementation of forward position kinematics and the Jacobian kinematics. This implementation is more numerically robust, is able to cache previous computations, and implements an algorithm for the computation of the Jacobian (with , the number of joints, and for a fixed size task space). by providing a way to specify the weights in task space, you can weigh rotations wrt translations. This is important e.g. to specify that rotations do not matter for the problem at hand, or to specify how important you judge rotations w.r.t. translations, typically in S.I.-units, ([m],[rad]), the rotations are over-specified, this can be avoided using the weight matrix. Weights also make the solver more robust . only the constructors call memory allocation. De general principles behind the optimisation is inspired on: Jorge Nocedal, Stephen J. Wright, Numerical Optimization,Springer-Verlag New York, 1999. Definition at line 64 of file chainiksolverpos_lma.hpp. Definition at line 68 of file chainiksolverpos_lma.hpp. Definition at line 67 of file chainiksolverpos_lma.hpp. Definition at line 69 of file chainiksolverpos_lma.hpp. The default parameters are chosen to be applicable to industrial-size robots (e.g. 0.5 to 3 meters range in task space), with an accuracy that is more then sufficient for typical industrial applications. Weights are applied in task space, i.e. the kinematic solver minimizes: , with a diagonal matrix. _chain specifies the kinematic chain. _L specifies the "square root" of the weight (diagonal) matrix in task space. This diagonal matrix is specified as a vector. _eps specifies the desired accuracy in task space; after weighing with the weight matrix, it is applied on . _maxiter specifies the maximum number of iterations. _eps_joints specifies that the algorithm has to stop when the computed joint angle increments are smaller then _eps_joints. This is to avoid unnecessary computations up to _maxiter when the joint angle increments are so small that they effectively (in floating point) do not change the joint angles any more. The default is a few digits above numerical accuracy. Definition at line 50 of file chainiksolverpos_lma.cpp. 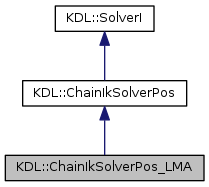 identical the full constructor for ChainIkSolverPos_LMA, but provides for a default weight matrix. Definition at line 84 of file chainiksolverpos_lma.cpp. Definition at line 139 of file chainiksolverpos_lma.cpp. computes the inverse position kinematics. T_base_goal goal position expressed with respect to the robot base. q_out joint position that achieves the specified goal position (if successful). E_NOERROR if successful, E_GRADIENT_JOINTS_TOO_SMALL the gradient of towards the joints is to small, E_INCREMENT_JOINTS_TOO_SMALL if joint position increments are to small, E_MAX_ITER_EXCEEDED if number of iterations is exceeded. Definition at line 187 of file chainiksolverpos_lma.cpp. Only exposed for test and diagnostic purposes. Definition at line 141 of file chainiksolverpos_lma.cpp. for internal use only. Only exposed for test and diagnostic purposes. compute_fwdpos(q) should always have been called before. Definition at line 158 of file chainiksolverpos_lma.cpp. for internal use only. Only exposed for test and diagnostic purposes. Definition at line 177 of file chainiksolverpos_lma.cpp. Definition at line 317 of file chainiksolverpos_lma.cpp. Definition at line 122 of file chainiksolverpos_lma.cpp. Definition at line 236 of file chainiksolverpos_lma.hpp. Definition at line 160 of file chainiksolverpos_lma.hpp. Definition at line 240 of file chainiksolverpos_lma.hpp. display information on each iteration step to the console. Definition at line 215 of file chainiksolverpos_lma.hpp. Definition at line 72 of file chainiksolverpos_lma.hpp. Definition at line 73 of file chainiksolverpos_lma.hpp. Definition at line 219 of file chainiksolverpos_lma.hpp. Definition at line 220 of file chainiksolverpos_lma.hpp. contains the gradient of the error criterion after an execution of CartToJnt. Definition at line 204 of file chainiksolverpos_lma.hpp. contains the last value for the Jacobian after an execution of compute_jacobian. Definition at line 197 of file chainiksolverpos_lma.hpp. Definition at line 221 of file chainiksolverpos_lma.hpp. contains the last value for after an execution of CartToJnt. Definition at line 175 of file chainiksolverpos_lma.hpp. contains the last number of iterations for an execution of CartToJnt. Definition at line 170 of file chainiksolverpos_lma.hpp. contains the last value for the (unweighted) rotational difference after an execution of CartToJnt. Definition at line 185 of file chainiksolverpos_lma.hpp. contains the last values for the singular values of the weighted Jacobian after an execution of CartToJnt. Definition at line 190 of file chainiksolverpos_lma.hpp. contains the last value for the (unweighted) translational difference after an execution of CartToJnt. Definition at line 180 of file chainiksolverpos_lma.hpp. Definition at line 238 of file chainiksolverpos_lma.hpp. Definition at line 218 of file chainiksolverpos_lma.hpp. Definition at line 161 of file chainiksolverpos_lma.hpp. Definition at line 162 of file chainiksolverpos_lma.hpp. Definition at line 242 of file chainiksolverpos_lma.hpp. Definition at line 235 of file chainiksolverpos_lma.hpp. Definition at line 241 of file chainiksolverpos_lma.hpp. Definition at line 239 of file chainiksolverpos_lma.hpp. contains the last value for the position of the tip of the robot (head) with respect to the base, after an execution of compute_jacobian. Definition at line 210 of file chainiksolverpos_lma.hpp. Definition at line 226 of file chainiksolverpos_lma.hpp. Definition at line 227 of file chainiksolverpos_lma.hpp. Definition at line 237 of file chainiksolverpos_lma.hpp.